The Youth Olympic Games are an international, multi-sport event for youth ages 14-18. It is organized by the IOC which also organizes the summer Olympics and winter Olympics. "Why Ann Arbor?" You may ask, well, Ann Arbor in the summer is basically deserted (accept for the Art fair), it would be extremely convenient for Transportation, Ann Arbor has already existing venues (e.g. Michigan Stadium), and has a prosperous economy. Ann Arbor is also used to big crowds (almost every Saturday) and could easily host the Youth Olympic games. -Please check out our AnnArbor.com article! 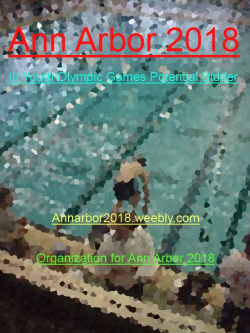 Please contact us at annarbor2018@gmail.com. This sight is maintained by the Organization for Ann Arbor 2018.